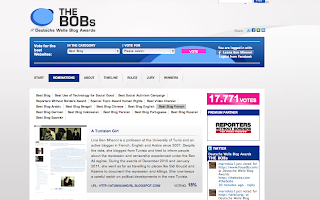 I've been nominated for the BOB's blog awards organized by The Deutsche Welle which honors websites in 11 languages that champion the open exchange of ideas and freedom of expression. Blog were just beginning to establish themselves as a new type of media and the BOBs aimed to show that this new form of communication was worthy of being taken seriously. The BOBs represent one of the Deutshe Welle ongoing efforts to contribute to promoting freedom of expression and the upholding of human rights around the world. If you like my blog vote for me here. tu va gagner lina tu est la meilleur. Good luck Lina ..you're the best! My vote is for you, congratulations for the nomination! 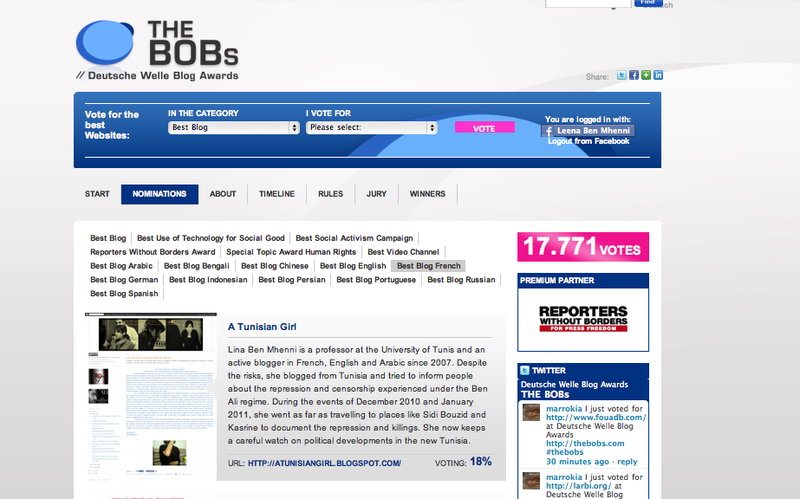 Congratulations for "The Best Blog"!! Cela est bien! Yoyage en fonction du but supreme! Malheureusement, je ne parle pas assez du francais pour comprendre. Congratulations!! Ánimo para seguir adelante.